Having not posted in quite a while - this is just a quickie to get back in the saddle! I'm currently ploughing through an MA, and this has swallowed up a whole bunch of time. Well - that and Modern Warfare 2, which I'm currently in the process of weening myself from (I find that I now no longer blink between my optimal gaming hours of 10pm - midnight). Seriously - I'm like Pavlov's Dog. As soon as I hear the swishy swish noise of (games makers) Infinity Ward's logo ident... my eyes start to gush in anticipation of 'only staring' - in pure adrenal fixation - for the subsequent two hours. You blink - you die. So - I'm revving up for a new painting over the next couple of weeks, and this focus will provide just the distraction I need. As long as I resist the urge welling up inside to buy Mass Effect 2.
mUst Ressissst - urge........!!! . This post features a couple of recently published pieces.... which is nice. 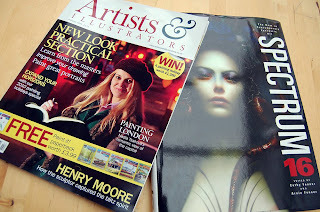 Artists and Illustrators Magazine have published a 'how to' type article, written by yours truly in their Feb Issue (now off the shelf I think). 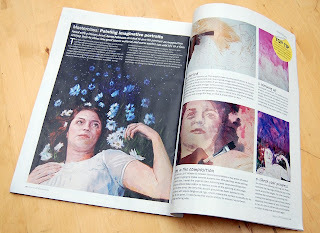 It was a four page spread, and focused on producing a portrait. Many thanks to Steve Pill for the invite to do something. Next - a piece accepted by Spectrum 16. Run as a competition, the annual features the best in fantastic art from around the world. 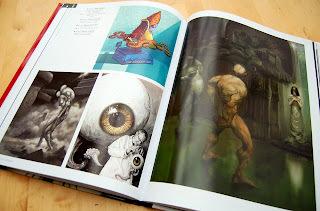 I'm stoked to have a piece accepted for this book - and kinda thrilled to have it on a page sandwiched between two images by the amazing Carlos Huante. Wow. Given the quality of Carlos's work, mine looks all the worse for it... but hey.... Carlos Huante everyone!!!!!! !